Q?What is the hardest part of the TMB? The highest pass? Most would acknowledge that the hardest climb of the TMB trail is the Fenettre D’Arpette pass which lies at 2665m on the stage 8 from Champex – Col De la Forclaz. The long climb up the valley through boulder fields and loose rock, matched with the highest pass ( jointly shared with the Col De Fours option on Stage 2) makes for the toughest ascent of the TMB. There is an easier option this day to go via Alp Bovine which is lower and less arduous and exposed in bad weather. On Stage 5 from Courmayeur to Refuge Bonatti there is also a tough option that forsakes the easier main route skirting the flank of the mountain and instead does a double ascent of two peaks with the highest being 2524m before descending to Refuge Bonatti. Q?Do you have to walk the TMB trail in one direction? No! It is entirely upto you to decide which way you prefer. The maps and stages on this site describe an anti-clockwise direction which is the traditional and most favoured way to do it. The reason being that some of the passes are less steep if walked in this direction and you will be going with the flow not against oncoming hikers – so you will pass less people in a typical day. But there are no rules regarding this and the Kev Reynolds guidebook is recommended for further research as it describes walking in both directions. Q?Are there National Park Fees to walk the TMB? No, there are no fees payable or permit required to walk the TMB. It is advisable to book ahead if walking independently to secure beds at refuges but no walking fees apply just your accommodation costs. Q?What is the best time of year to walk? What will the weather be like? A: The TMB has a limited window for good weather – June through to September is the recommended time to travel if wanting to walk the circuit. Outside of these times the passes are most often blocked with snow and it is not recommended for people not experienced with Alpine walking and snow conditions, plus many of the Refuges will be closed. So the summer really is the time to aim for safe and enjoyable walking with the maximum options for sleeping. June can still be quite cool and it is not unusual for snow to be on the passes in mid June but generally speaking during this period you can expect 20-30C at lower altitudes and at night temperatures can fall below 10C. July and August can get hot in the valleys but of course the higher your altitude the cooler the temperature, so you can still expect cooler or even cold weather on the passes. July and August also tend to be busier months and many French people are on holiday from mid July so expect the trails & refuges to be more crowded at these times. Being in high mountains you should prepare for all eventualities with weather and make sure you have adequate clothing.Sometimes you will be able to walk in shorts and a t -shirt but at other times you may need to rug up to cross a pass or have cloud and damp conditions set in – all on the same trip! High altitudes will always be cool and if cloud sets in it can be cold & damp. It is not uncommon for snow to be on the passes into summer after a cold spring and if you are travelling with a local guide they will advise whether any additional equipment is required such as Crampons, which can be hired locally. Check out the links on our resources & links page to weather sites in the locality and use these to prepare for your trip – there are many good gear shops in Chamonix if you need more clothing! Q?Q: I’m unsure of my ability to walk some of the steeper sections, is there the ability to be transferred by bus or take or cable car if I need a break? A: There is some transport available in some valley sections, but they may not take you from valley to valley so it is best to physically prepare for being able to complete the full trek. Where you are participating in a guided group tour you will generally have you main luggage transported for you from accommodation to accommodation, so there may be the option to use that transfer is you need a break from walking for one day (you would need to consult with your tour company regarding this option). There are also cable cars at Bellevue ( stage 1) and La Flegere ( stage 10) which can save ascents / descents on those days. Q?Q: Is it safe to walk the Mont Blanc Circuit alone? A: You can walk the circuit on your own, or as an unguided group, but you need to be a confident and experienced mountain alpine walker. We don’t recommend doing the Mont Blanc circuit alone or without a guide if you are an inexperienced walker. If bad weather sets in the passes can be difficult to negotiate if you’re not familiar with the tracks, it can be easy to miss your path. Q?Q: Do I require a Visa for Europe? Visa requirements for Europe depend on where you are from and where you are going. As a general rule Australians won’t require a visa (if staying no longer than 90 out of 180 days) but may need at least 6 months validity on their passport. Rules do change though and it is therefore important that you check for yourself with your local embassy or travel agent prior to travelling. Q?Q: What currency do I need? A: France and Italy use the Euro and Switzerland the Swiss Franc, but the Euro is widely accepted in Switzerland as well as at most shops serving tourists. The recommended currency for exchange is Euros. Take some in cash with you to avoid having to change money at the beginning of your trip. To Exchange currency, you can do this in Chamonix. Please note that Geneva airport is in Switzerland, which is not part of the Eurozone so you will need to wait until Chamonix to exchange money. There are also a large number of ATM cashpoints that accept Visa and MasterCard’s in Chamonix as well as credit card acceptance in the major restaurants and shops. Q?Q: What is the food like in the refuges? A: You will probably find that you will be eating the majority of your breakfasts and dinners in the refuges while you have your lunches while out trekking. Breakfast in the refuges will usually consist of coffee, tea, cereal, yoghurt, fresh fruit, bread, and conserves. Evening meals generally consist of a first course of soup, salad or charcuterie, a main course of meat with one or two vegetables or rice or pasta, and a dessert course. Standards do vary from place to place. In most you’ll enjoy a hearty evening meal that will satisfy all but the fussiest hiker. Lunches offerings also tend to be quite good and adequate enough nutrition. Breakfasts provided by refuges however often leave something to be desired, some can be good but often white bread, jam and instant coffee is the order of the day with the more basic ones. That is where travelling with a group organiser who brings in additional supplies can be the answer or stock up with some muesli etc. Q?Q: What is the accommodation like in the refuges when walking? A: Refuges vary in their standards and facilities, some are modern some are older and more basic – but generally are in excellent locations in the mountains. ( Understand that refuges are usually your only choice in ‘on mountain’ locations whereas in the populated valleys you have more choice and can stay in hotels if you choose) If you are used to hiking and staying in walkers huts then you’ll be pleasantly surprised and find Refuges quite comfortable and more than adequate. If this is the first time you’ve tried anything like this and your idea of roughing it is a 2* hotel then you’ll need to adjust your expectations! Some refuges are wonderful rustic ex- farms that have been converted to accommodate hikers where the accommodation is much more basic and communal. The atmosphere is friendly and jovial as hikers from many countries gather to spend the night. You may find some refuges have private rooms of triple/ quad share but these will generally need advance bookings. You will mostly find shared dormitories that provide mattresses, pillows and blankets with shared indoor toilet and shower facilities. 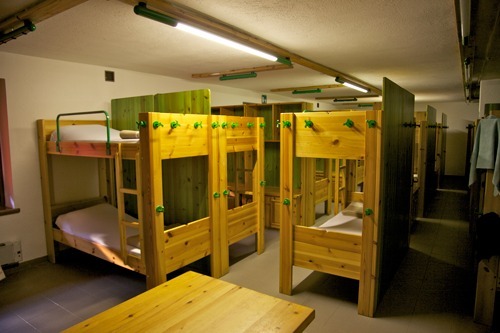 Pictured below is the dorm the refuge Elena in Italy – for more detail and pictures see the accommodation page. Q?Q: Do I need to worry about altitude sickness? A: No, altitude sickness generally can occur at heights over 3000 metres and all the passes along the Mont Blanc circuit are below this, therefore it would be very unlikely that you would suffer from altitude sickness. You may however experience some affects of being at high altitude while walking, such as slight shortness of breath. Q?Q: How do I get to Chamonix? A: International fights are best into Geneva International Airport and then Chamonix is approximately 1.5 hours by bus transfer from Geneva. Share and private bus transfers are easily accessible from the airport. You can also travel by train into Geneva and the main train station is only about a 10min shuttle bus ride to the airport where you would be able to connect to a bus transfer to take you to Chamonix (prior booking would be required). Q?Q: Do I need to be an experienced walker? A: The answer depends in part on whether you are walking independently or with a group. For the former you definitely need to be an experienced mountain walker, the latter less so but you’ll need good fitness and should still have some experience. You will need to have a good level of fitness and partake in regular physical exercise/training prior to your trek, but you don’t need to be an experienced trekker if you are walking with a guide, although some experience with walking is an advantage, this trip is not for the novice walker. You will also need to practice hiking in a mountain environment with your equipment that you’ll be taking to Mt. Blanc. You should prepare for walking several hours (5-7 hours) a day with steep ascents and descents. Q?Q: What sort of training do I need to do? A: You will need to practice hiking in a mountain environment with your equipment that you plan on using e.g. Walking poles and trekking boots. You should prepare for walking several hours (5-7 hours) a day with steep ascents and descents. Generally speaking you may average 800-1000m a day in ascents so your training should reflect this in the led up to your trek. Choose hills with steep ascents to train on and push yourself to do long days to prepare yourself adequately. You should have some experience in walking in a mountain environment to consider this trip – it is not a novice’s trip. Q?Q: What is the difficulty level of the Mont Blanc Trail? How fit do I need to be? 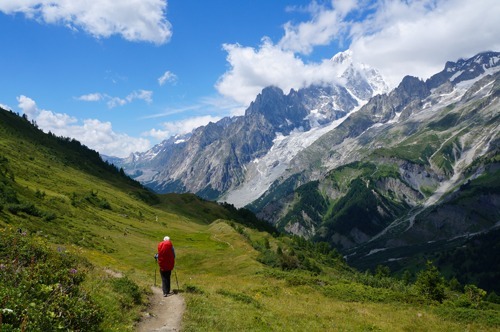 A: The Mont Blanc circuit can be considered a moderate to demanding trek for any walker, the fitter you are the more enjoyment you will receive out of the walk. There are sections that are fairly easy going while other parts demand long ascents and steep pitches. Obviously at 180km there is a variety of conditions and gradients experienced. Fitness is a difficult question to answer as people’s perceptions of what ‘reasonably fit’ is vary considerably. Some people find Mont Blanc easier than they expected and others much harder. The best way to assess whether you are fit to do walk like Mont Blanc is to go and do some walks with comparable ascents and descents now. Find a walk near you with 800-1000m of vertical ascent and see how your body copes with tackling that. If you find it a real struggle and not enjoyable then you’re probably not well suited to this trek and should avoid it. On the other hand if you can manage and may feel tired or sore but enjoy the walk then you are probably Ok to walk the circuit – just make sure you keep up the training and you’ll enjoy it a lot more as you need to condition your body to multiple days of walking on the TMB. Trek specialists like RAW Travel have many years of experience with taking people on treks like Mont Blanc and can offer good advice if you are unsure of whether you will be suitably fit to join one of their groups. Q?Q: What is the best footwear to use? 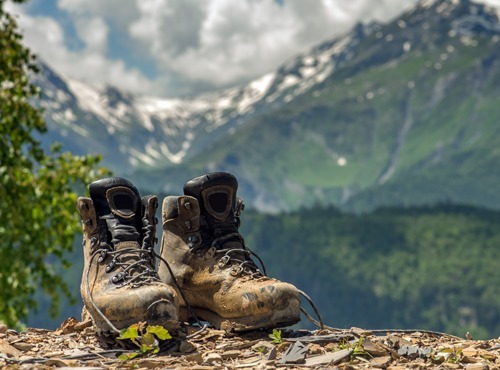 A: Good quality, well worn in hiking boots with good ankle support are strongly recommended purely for ankle stability on the rocky track sections and for walking through snowy areas on the higher passes. Whilst you could wear walking shoes / outdoor trainers in the valleys they are not recommended for the passes. If there has been a cold spring and snow on the passes you may even need to use crampons ( an unusual circumstance but possible) in which case boots are essential. Q?Q: Do I need walking poles? A: Walking poles are highly recommended, they are good for balance and taking weight off your knees on descents. If you are accustom to walking with poles and have a pair of your own then you can take them with you but do remember to pack them as part of your main luggage. Walking poles can also be hired in Chamonix at approximately 5 euro a day. If you have not walked with poles before but plan to do so we strongly recommend that you practice walking with them prior to starting your trip. Q?Q: What is the track like? A: Underfoot you will experience a variety of tracks and trails. Typically the mountainous sections of the Tour du Mont Blanc run on single-track paths that can be rocky in places, sometimes with steps but mostly just the bare earth. Mud is not a problem in the same way as on Mountain paths in Victoria, for example! Tracks are also common – perhaps gravel forest roads, ski pistes, or rough tracks for vehicles over agricultural land. There are some sections of country lanes, of which the longest is one 4.5km stretch near Les Chapieux. Depending on Spring weather in Europe there may be snow on the passes.